UK angler Stephen Scrutton continued his Thailand fishing holiday with a visit to the Maeklong River in Samut Songkran fishing for stingrays. 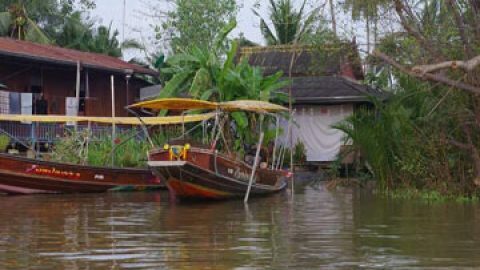 On arrival at the Maeklong River the angler boarded the fishing boat and was soon positioned on a wide bend of the tidal river. After positioning baits at various intervals across the river the angler waited for events to unfold. With the river now at full capacity the angler did not have long to wait until one of the baits was picked up. Winding down into the unseen Giant freshwater stingray saw the heavy stand up rod bent down towards the water. The Giant freshwater stingray was clearly a small specimen as the angler proceeded to winch the Giant freshwater stingray up to the surface without a great deal of resistance. On reaching the surface the Giant freshwater stingray angrily lashed the boat with its tail as it was quickly grasped by the guide and brought into the boat. After making the barb safe with a bandage the Giant freshwater stingray was brought to the river side for pictures. The Giant freshwater stingray with a width of 90cm’s was quickly photographed and released back into the river. After repositioning the baits the angler was soon into another Giant freshwater stingray of a similar size which immediately buried itself into the muddy riverbed. Constant pressure soon took its toll on the Giant freshwater stingray and saw the stingray quickly boated once again. The Giant freshwater stingray (male) was quickly photographed before being released back to the river. The following few hours saw the angler trying to keep his line free from floating debris as it washed down the river. With only another hour or so fishing time left one of the baits was picked up by another Giant freshwater stingray which moved steadily off down stream. On connecting with the Giant freshwater stingray the stingray responded with a violent burst of power which stripped several yards of line from the Okuma multiplier reel. Stephen wound down into the unseen monster stingray and notched the gear up on the reel causing the run to come to a halt as the Giant freshwater stingray embedded itself deeply in the muddy substrate. The fishing boat was positioned directly above the stingray allowing the angler a more direct line of pull. Steve once again began to apply pressure from above and after ten minutes the Giant freshwater stingray broke free from its muddy lair. The Giant freshwater stingray was quickly brought off the bottom where it was allowed to glide around in the relative safety of mid water. Five minutes later saw the Giant freshwater stingray brought alongside the boat where it was expertly netted. 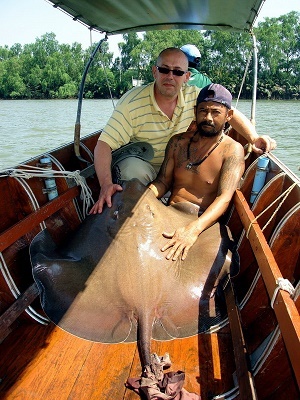 At the riverside the Giant freshwater stingray was estimated to weigh 40kg’s and identified as being a female.